The Apache tribe was considered to be an aggressive group of people that lived the nomadic lifestyle. Although they were known for their excellent warfare skills the Apache people also had an exclusive sense of design. 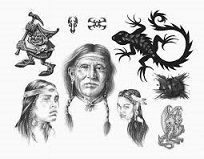 Apache Indian designs come forward in a wide variety of arts and crafts that were practiced amongst the tribe members. The Apache tribe members are credited for coming up with some unique weaving techniques that can be best seen displayed in their collection of rug designs. Rugs were produced by the tribe members for utility purposes as well as for decorating their homes with. It was also one of the revenue earning activities as they used to sell specially woven rugs to other tribes for money or in exchange for goods. Music is an integral part of the native Indian culture. Native American Indian music is primarily based on percussion instruments and drums have been one of the most important musical instruments used by all Native Americans. Every tribe had different types of drums for different occasions. The Apache people used to create double skinned drums that had to be played with gongs and specially produced drumsticks. They would often decorate their drums with various adornments and paintings. The Apache Indians would create pots for utility purposes. With the passage of time however they started experimenting with larger sized pots which they would adorn with different patterns. The purpose of creating such pottery was to add some charm to the interiors of their homes. The Apache tribe started off with basic designs and slowly moved towards creating more intricate patterns on their pots while experimenting with shapes and sizes as well. The Apache tribe is perhaps best known for its amazing variety of jewelry designs. As it is the tribe was renowned for mastery in silversmithing which they employed to create unique jewelry designs. Silver was the medium of choice when it came to jewelry. They would incorporate the use of some exquisite precious stones such as lapis lazuli and Jade to create some brilliant work of jewelry. The designs were inspired by historical symbols that held great significance amongst the tribe members. Today Apache Indian jewelry has been reintroduced to the modern masses with a contemporary twist and is largely successful. Painting is not something that is normally associated with Native American Indians. However the Apache tribe is credited for giving birth to some of the most underrated painters. In fact painting was a popular artistic activity in this particular tribe. Because of their closeness to nature most of their paintings are based on themes inspired by their natural surroundings. You will also be able to find abstract paintings in which the artist has tried to depict mythological characters that are held in high reverence amongst the tribe.